Ruth Wykoff, age 90, of Aurora, passed away Wednesday, February 8, 2017 at her home. A Memorial Service will be held at 10:30 A.M. Saturday, February 11th at the Aurora United Methodist Church. Rev. Karla Sheffy will officiate. Inurnment will be in the Aurora Cemetery. Visitation will be from 5 – 7 P.M. Friday at Higby-McQuiston Mortuary. Memorials may be made to the family, for designation at a later time. Condolences may be e-mailed to the family through the mortuary website at www.higbymortuary.com. 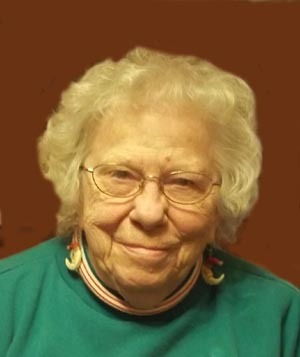 Ruth Marjorie Wykoff, the daughter of Soren and Mabel (Nelsen) Nelson, was born in Omaha, Nebraska on January 24, 1927 and passed away in Aurora, Nebraska on February 8, 2017, at the age of 90. She graduated from Aurora High School in 1945. Ruth married Bob William Wykoff on November 1, 1952 at Tijuana, Mexico. Bob passed away on November 28, 1966. Ruth began her career working at the Aurora Hospital and was there when they moved to the new Memorial Hospital. Ruth retired after 30 years in 1975. She then was a Teacher’s Aide for the 5th & 6th grades at Aurora Elementary for 17 years. Ruth retired a final time at age 75 after being a hostess at TreeTops, where she loved meeting and greeting people. Ruth was an avid sports fan. She enjoyed Husker football and Royal’s baseball the most. Ruth had a passion for gardening that came from her parent’s owning Keystone Gardens when she was growing up. Ruth was a member of Aurora United Methodist Church. Ruth considered everyone a friend and loved to share a hug with everyone. She was preceded in death by her parents; husband; son, John Wykoff and sister, Maurine Nelson. Those left to cherish her memory are her daughter, Chris Wykoff of Grand Island; nephew, Mike (Gail) Nelson and their daughters and families of Aurora; cousin, Richard (Beverly) Gustafson and family of Aurora and many people she considered to be family.